Disclaimer: Pawfect Nation retains intellectual property rights in relation to all its exclusive concepts, ideas, materials, documentation and logo designs. Pawfect Nation reserves the right to bring legal action against any individual or entity found to be imitating or misusing the same. Committed to promoting animal rights as being equally important as human rights. As long as animals are treatable they should be treated, rehabilitated, or receive life long special care. Pawfect Nation is a registered non-profit and public benefit organisation that advocates for animal rights and animal welfare practices, as well as the protection of wildlife and environmental conservation. 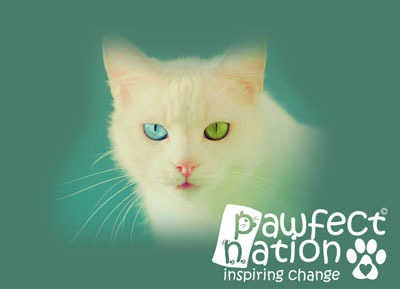 Pawfect Nation was established in 2010 and has been advocating for animal and environmental causes since then; Pawfect Nation has grown its Facebook page to over 4000 followers and can also be found on Twitter under the same name. Pawfect Nation is presently a cat sanctuary, but the ultimate goal is for Pawfect Nation to establish a pro-life animal sanctuary that will house other species of homeless, abandoned and abused animals. Pawfect Nation abides by a 100% pro-life and pro-quality of life philosophy. We do not put down any healthy animals; this includes elderly, disabled or differently-abled animals. Only animals that are visibly suffering and cannot be saved with medical attention will be considered for humane euthanasia. Pawfect Nation's sanctuary also abides by a 100% 'no cages, no chains' philosophy. We do not believe in chaining or caging animals because they are not criminals, nor are they our prisoners. As Scotlund Haisely, former Director of HSUS, aptly stated: "The cage is a fundamentally flawed contraption that causes rapid emotional, social and physical decline of its inhabitants." In addition to the above two philosophies, we are also opposed to animals being regarded as our property; animals are living, sentient beings that have a right to live their lives free from possession. We should therefore not refer to ourselves as their owners, but instead regard ourselves as their caretakers or their guardians because they become part of our families too. In 2006 Scotlund Haisley was the CEO of the Washington Animal Rescue League (WARL) and Scotlund conceptualized and led the renovation of a shelter without bars - a shelter that meets the needs of animals in transition. We hope that Pawfect Nation will see the same success as the Washington Shelter in the USA. "If you build it, they will come,” declared Scotlund Haisley, referring to the generosity of donors who funded the renovated, state-of-the-art shelter in Washington. The shelter was constructed with empathy for the companion animals who would inhabit its space." As volunteers all we ask is that you support us in any way you can; financially, via man-power, or by securing sponsorships for our animals. A little sharing and spreading of goodwill can go a long way in helping us to save these innocent lives and give them a second chance at life and love. Help us to help them, please.